Alexander Steen scored twice to bring his season total to 24, tying his career high set in 2009-2010. ST. LOUIS — Alexander Steen scored twice and Jaroslav Halak made 25 saves against his former team to lead the St. Louis Blues to a 5-1 win over the Montreal Canadiens on Thursday. Steen, who signed a three-year, $17.4 million extension earlier in the day, has 24 goals, tying his career high set in 2009-2010. Chris Stewart, Jaden Schwartz and Maxim Lapierre also scored for St. Louis. T.J. Oshie added two assists. Steen started a three-goal outburst in the first period for the Blues with a short-handed goal at 4:20. He scored again at 7:55 to make it 2-0 with his 24th goal. Steen is second in the league in goals behind Washington’s Alex Ovechkin, who has 28. Stewart capped the early blitz with his 10th goal of the season at 13:33. It was his fifth in as many games. The Blues had been outscored in 6-1 in the first period in their three previous games. Montreal goalie Carey Price gave up three goals on the first eight shots and fell to 16-11-2. Notes: Montreal C Daniel Briere was a healthy scratch for the first time this season. … Schwartz returned to the lineup after missing two games with an upper-body injury. 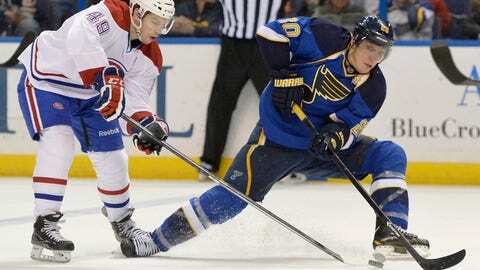 … The Blues beat Montreal 4-1 in the teams’ previous meeting in St. Louis on March 10, 2011. … The Blues will play 12 of their next 13 games against Western Conference opponents. … St. Louis LW Brenden Morrow picked up his 300th career assist on Stewart’s first-period goal. … Montreal D Alexei Emelin was on the ice for all three of the Blues’ first-period goals. … The Canadiens’ previous win over St. Louis came on Jan. 4, 2007.